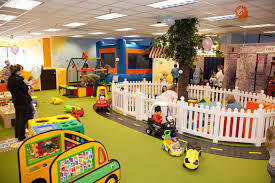 This children's play center is an interactive, indoor play center that brings imaginations to life through educationally centered play. Our 8,650 sq ft building will house exclusive 4 hour preschool classes with: 2,3, and 4 day options. This center preschool program is an innovative program, using a curriculum that’s tried and true with new learning techniques that children can’t get enough of. Our venue is a one stop, dream party destination. 15+ pre designed “perfectly Pinterest” parties to choose from! Our cafe gives parents the perfect escape to sit back and enjoy a nice cup of coffee and socialize with friends or get work done, all while having a open view to your children playing! We will also offer last minute drop in care hours! !